Before you buy wheels, it’s important to get a better education on the versatile subject. We have prepared a detailed breakdown of wheel specifications. We’ve also created a detailed outline of the measurements that you should better understand, whether you are a consumer, an enthusiast, or an aftermarket wheels distributor. To better appreciate the relationship between a wheel and a tire, with 24 inch wheels for example, you have to understand the mechanical characteristic of their union. Let’s face it, there’s no other single component more important than your wheels and tires because the entire car rests on their weight. Our detailed breakdown includes helpful charts, a glossary of wheel and tire measurement terms, and information on wheel alignment, centering, and offset. If you are ready to buy rims, we hope you will enjoy reading all about wheel and tire dynamics. This defines the overall width of a tire, width is measured from the inner to the outer sidewall. If your tire has a lip bead (or protective rib or raised lettering) then this is included in the measurement. This is the measurement of the tires width from sidewall to sidewall (not including the protective ribs). It is important that this measurement be taken when the tires are properly mounted and inflated with no load on the tires. This is the distance from the wheel’s axle center to the outer tread surface of the unloaded and properly inflated tire. This measurement is measured with load on the tire and is taken from the axle centerline to the treat contact area or patch. The distance from the outer edge to the inner edge of the tread. The design curvature or contour of the tread profile. 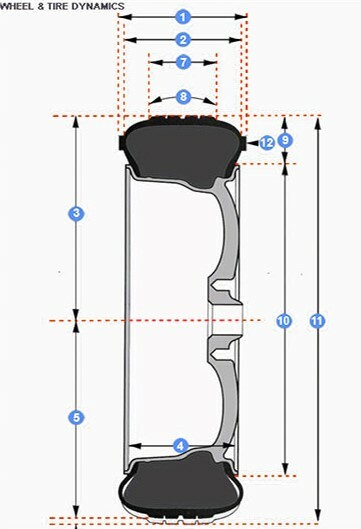 This measurement of the vertical distance between the tire’s bead seat and outer tread surface when properly mounted and inflated with no load on tire. This is measured as a linear distance between the bead seats which are taken at the widest point. You probably don’t need help understanding this but it’s the distance from the tread surfaces at its widest point. The tire should be aired to the prescribed air pressure and under no load. Having the appropriate adjustments will maximize the life of your tires. In a nutshell, wheel alignment consists of adjusting the angles of the wheels so that they’re perpendicular to the ground and parallel to each other. 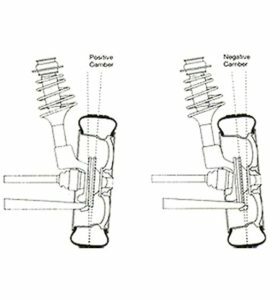 The purpose of having the appropriate adjustments is the maximize tire life. In short, you want a vehicle that tracks straight and true when you are driving alone a straight and level road. Look inside almost any wheel and you should find various markings which give you pertinent Camber is the inward (negative) tilt of wheels when viewing the vehicle from the front. If the top of the wheels is leaning out from the center of the vehicle, then the camber is positive, if its leaning in, the camber is negative. Excessive positive or negative camber causes wear on the outside or inside tread of the wheel (one-side wear). Use of the king point offset improves steering ease. The toe measurement is the difference in the distance between the front of the tires and the back of the tires. Since tires with camber have the tendency to slant inward or outward (camber thrust) when viewed from above, tires are set as close as possible to zero. Toe-in means that the front of the tires are closer to each other than the rear. Toe-out is just the opposite, tires with excessive toe-in or toe-out suffer more readily form feathering. The toe position will vary depending on the driver system and the type of suspension as well as between the front and rear wheels. Tires suffer from feather edge wear when improperly aligned. The fact that a wheel physically bolts onto a car doesn’t necessarily mean that it “fits.” The centering surface could be too large, in which case there is essentially no centering. Just as importantly, the offset could be wrong. The King Pin Offset is the distance from the point where the suspension axis intersects the ground to the longitudinal line that runs through the center of the tire’s contact patch. The King Pin Offset affects the vehicle’s steering, braking and handling characteristics. The example, steering handling becomes lighter as the king pin angle narrows. Allows, king pin angle has a major impact on the ability of the steering wheel to return to its start position. 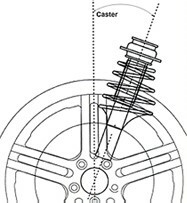 Caster is the degree (as represented in an angle) to which a wheel is situated ahead of or behind the top mount. It ensures the force, which attempts to restore the wheels direction to the straightforward direction when the steering wheel is turned. Get a better understanding of the wheels on your car. From coded markings to technical descriptions, this simple guide will give you a better understanding of the wheel and the terminology which comes along with it. Look inside almost any wheel and you should find various markings which give you pertinent information on the wheel. Typically, they’re marked on the rim and, just for conversation sake, we will take into consideration a wheel that is marked “15×6 1/2 JJ114.3”. The first number is quite obvious and represents that the wheel is 15 inches in diameter, while “6 1/2” is the width of the wheel and measured from the distance between the flanges that support the bead. The “JJ” refers to the space of that flange; easier to understand if you imagine a steel wheel on which the lip is rolled over like a JJ. “ET” may or may not be present, and if you do see it is the abbreviation of einpress tief, German that translates literally as “pushed in depth,” or offset. The “33” is the offset measurement. The other element that affects directly whether a wheel can be bolted onto a car is hub centricity. Long ago, in the deep mists of time, wheels were located by taper of the lug nuts or bolts. This could lead to all sorts of problems, but they can be summarized by saying centering was liable to be less than perfect, and the sheer stress on wheel bolts or studs could be enormous. We are not aware of any passenger car wheels now made that are not hub centric. Hub centric wheels have a hole at their center that fits closely over a round feature on the hub, serving to center the wheel on the axis of the spindle, as well as bear the vertical weight of the vehicle. The wheel bolts or studs then serve simply to hold the wheel onto the hub, and are loaded only in tension, where they are strong. If the studs were required to absorb vertical forces, they would be loaded in single shear, the weakest arrangement for any fastener. Factory wheels are all machined to fit their specific application exactly, and some for the better aftermarket wheels are, too. If you buy wheels that use centering rings, be sure that the rings fit snugly in the wheels. if they are loose enough to fall out, how accurately can they be locating your wheel? Some tire shops automatically remove centering rings to balance wheel, just to make sure that there is no slop to make their balancing inaccurate. 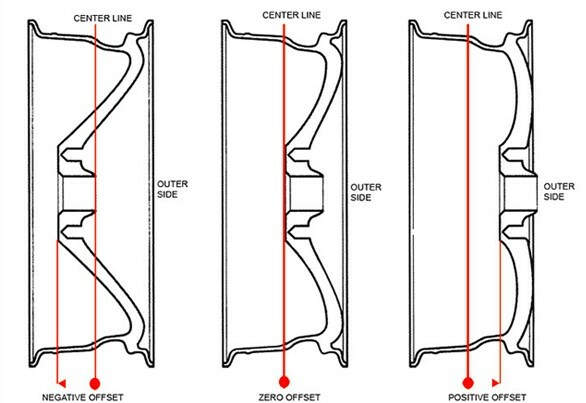 Offset is the location of the flat mounting surface of a wheel relative to the wheel’s centerline. Negative offset means that the mounting surface is toward the center of the car, positive offset means that it’s toward the outside of the car, or the wheel is “pulled in” toward the center. Offset affects many things other than just whether the wheel has the appearance of “sticking out” past the fender. The wrong offset can cause rubbing problems when the suspension is compressed of the wheel is turned. Offset affects the steering geometry’s scrub radius, possibly leading to problems with torque steer or self-centering characteristics. 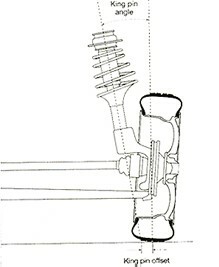 Offset also affects the suspension’s motion ratio, which directly determines the effective spring and damper rates. Potentially, in a very heavily loaded vehicle, or with extreme changes in offset, wheel bearing life can be affected, but this is more often talked about by truck people than by small car enthusiasts. It is very, very important that the proper offset wheel be used. While not directly a matter of offset, brake caliper clearance is a related issue. If you have, or plan to have big brakes on your car, be sure that you wheels that you are going to use, will fit over the calliper. Spacers are available to solve the problem if they don’t, but it is best to get a wheel with enough dish to meet your offset specs and still fit your brakes. Consulting the wheel and brake manufacturers ahead of time is wise. Many aftermarket brake companies even have templates of their brakes available that you can easily check against any wheel.